An arched entry complements this quintessential country porch, framed in columns, while a metal roof adds character. 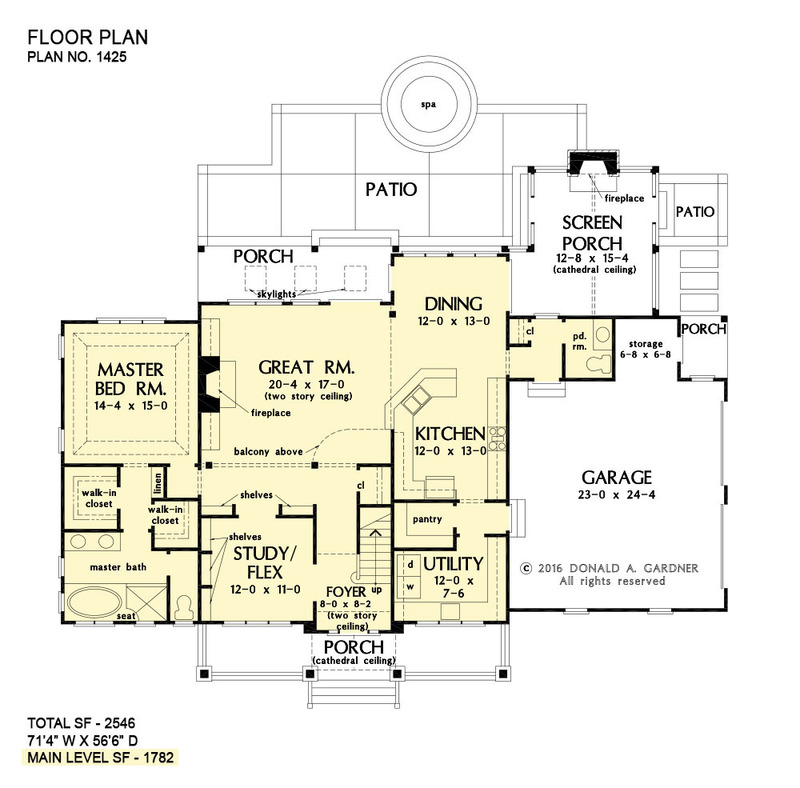 The floorplan matches the simplicity of the exterior providing an easy flow throughout. Modern amenities include an oversized pantry and utility room with sink and wrap-around counters. 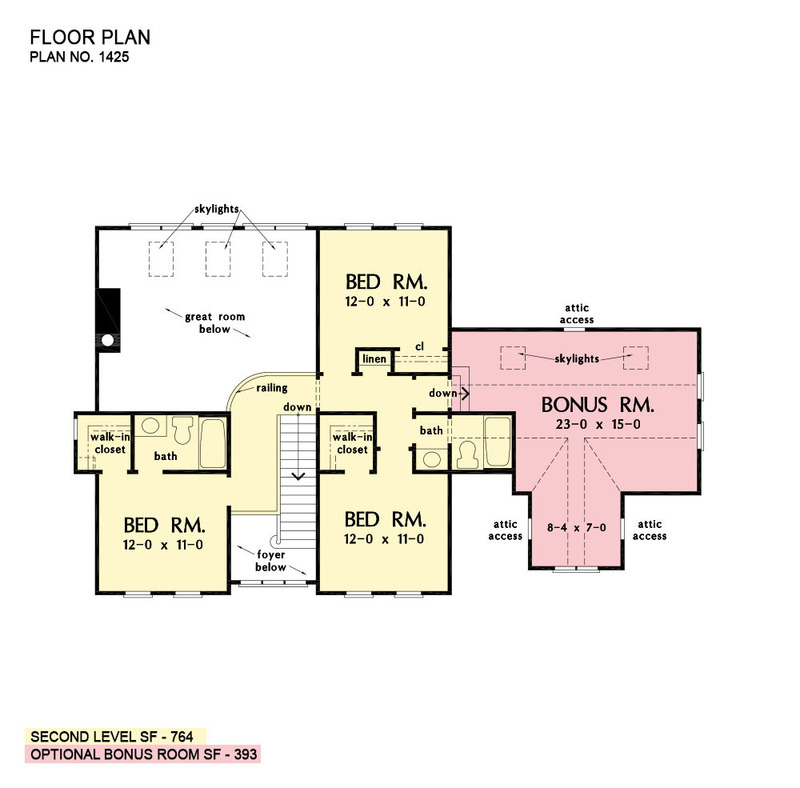 This design features a large master suite and study and three additional bedrooms upstairs. 1st Floor: 1782 Sq. Ft.
2nd Floor: 764 Sq. Ft.
Porch - Screened: 247 Sq. Ft.
Porch - Rear: 135 Sq. Ft.
Porch - Right: 33 Sq. 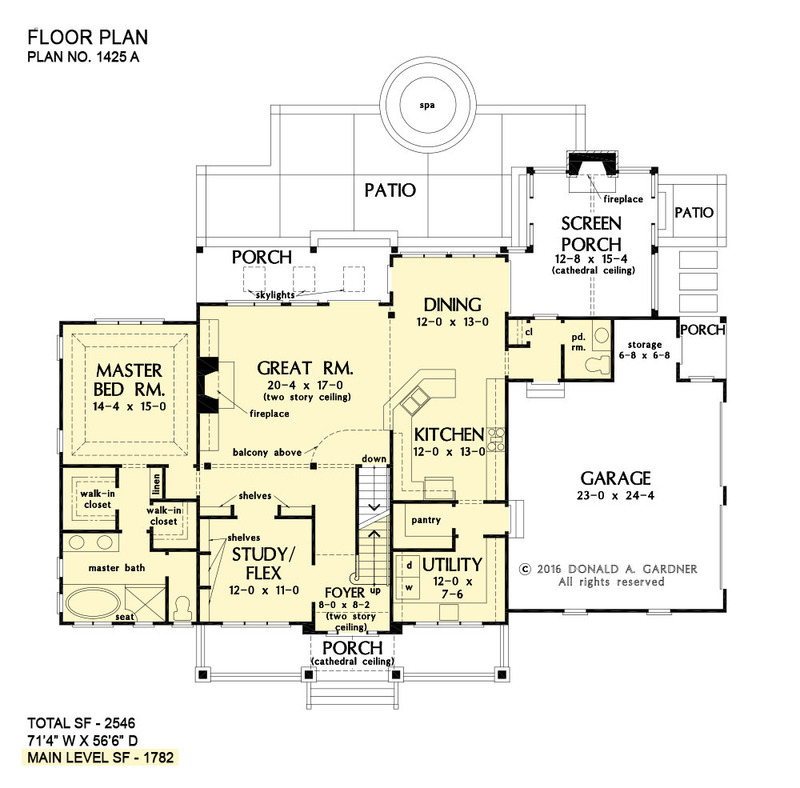 Ft.
House Dimensions: 71' 4" x 56' 6"
Great Room: 20' 4" x 17' 0"
Foyer (2 Story): 8' 0" x 8' 2" x 18' 1"
Dining Room (Flat): 12' 0" x 13' 0" x 9' 0"
Great Room (2 Story): 20' 4" x 17' 0" x 18' 1"
Kitchen (Flat): 12' 0" x 13' 0" x 9' 0"
Study (Flat): 12' 0" x 11' 0" x 9' 0"
Utility Room (Flat): 12' 0" x 7' 6" x 9' 0"
Bonus Room (Clipped): 23' 0" x 15' 0" x 8' 0"
Garage (Flat): 23' 0" x 24' 4" x 0' 0"
Garage Storage (Flat): 6' 8" x 6' 8" x 0' 0"
Bedroom #3 (Flat): 12' 0" x 11' 0" x 8' 0"
Bedroom #4 (Flat): 12' 0" x 11' 0" x 8' 0"
Porch - Front (Cathedral): 33' 4" x 6' 0" x 9' 0"
Porch - Rear (Flat): 20' 8" x 6' 0" x 9' 0"
Porch - Right (Flat): 5' 0" x 6' 8" x 9' 0"
Deck / Patio (None): 41' 7" x 20' 4" x 0' 0"
Porch - Screen (Cathedral): 12' 8" x 15' 4" x 16' 8"
Balcony (Flat): 8' 5" x 3' 8" x 8' 0"